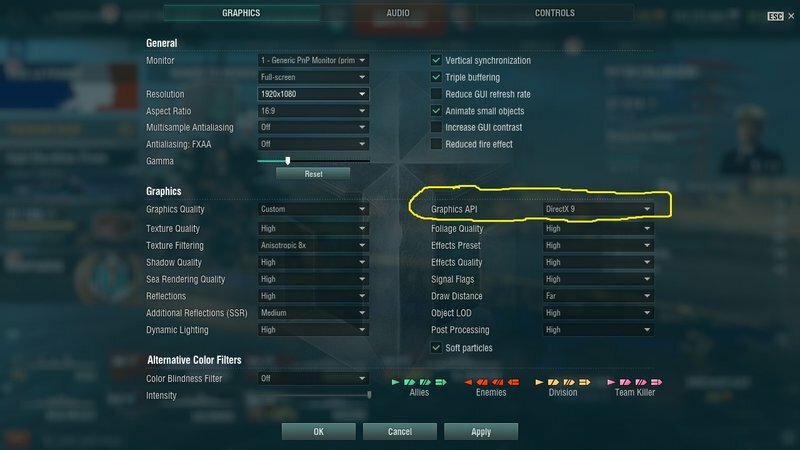 If you our having the severe frame drops since last update/patch you can try this...Okay it looks like changing DX settings from 11 to 9 in wow settings fixed my issue for now..Played 5 games and I was back to 50 to 70 frames a second in all the games..Read a post a few min ago and someone changed settings from DX 9 to 11 and fixed it for them..I am running windows 7 64 bit...You may try switching DX around in wow setting to see how it works for you if you our having severe frame drop issues since last update/patch its worth a try..The game does not look as fancy but until WG fixes the issue I can deal with it.Do not comment about hardware such as CPU GPU causing this problem as we know that hardware is not the issue with the severe frame drops since last update/patch..Anyways hope changing DX version helps others as it worked for me..
Roger switching Direct X around in <esc> Settings Menu. How do I get ships to render quicker when they fire in open water? All I get is a black puff of smoke, then up to 5 seconds delay before they appear -- then vanish again after 2 seconds. Is usually associated with a spike in the lag time. Seems only certain 'skilled' players can do this. Just posting to say Thank You! My FPS has gone from an average of 25 since the recent updates to about 37, not as good as it used to be, but a huge upgrade!